Have a question for SDR Serviced Apartments? "Good place nice'for a stopover and close to airport"
"Near restaurants and supermarkets ." "Cooked in the unit's kitchen three nights in a row - enjoyable and relaxing"
"It is very close to the airport, which is convinient." 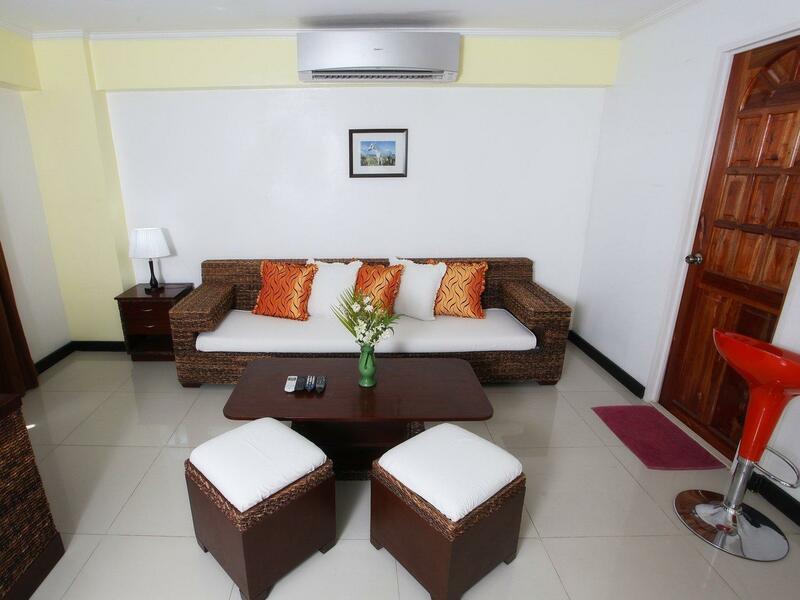 If what you're looking for is a conveniently located hotel in Cebu, look no further than SDR Serviced Apartments. From here, guests can enjoy easy access to all that the lively city has to offer. With its convenient location, the hotel offers easy access to the city's must-see destinations. SDR Serviced Apartments offers impeccable service and all the essential amenities to invigorate travelers. The hotel provides 24-hour front desk, Wi-Fi in public areas, car park, family room, car hire to ensure our guests the greatest comfort. The hotel features 30 beautifully appointed guest rooms, many of which include television LCD/plasma screen, towels, internet access – wireless (complimentary), air conditioning, wake-up service. The hotel's recreational facilities, which include outdoor pool, massage, children's playground, pool (kids), garden are designed for escape and relaxation. 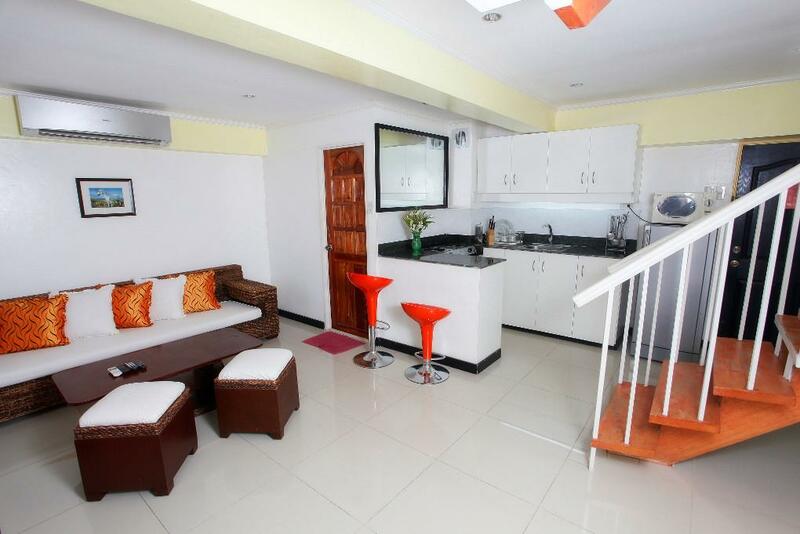 SDR Serviced Apartments is an ideal place of stay for travelers seeking charm, comfort and convenience in Cebu. "Good place with good service and nice location ." Cheap apartment for a few hour stay before an early flight. Could have been worse, could have been much better. Desk staff was no where to be found, unable to locate for 20 minutes. Good enough for a 4 hr. nap after a frustrating check in. We stayed here for an afternoon as we had to get a flight in the evening. The taxi had a hard time finding it as the name outside is different than SDR...and no signs for SDR anywhere. We got our room such had very big. But the place is quite run down.. low maintenance. The aircon wasn't working. The water plum was making such a bug noise every 2 min We had to unplug it. There was a kitchen but no knife or fork or even a glass! The TV channels weren't working... anyway. The pizza restaurant next to it does the best pizzas I've tried in the Philippines!!! So.. Ok for a quick stopover but not much more. The apartment was huge. 2 bedrooms, sleeps 4-5. I would have preferred smaller, with attended desk, towels, aircon remotes in place, a bathroom door not broken in half etc. But it has promise. Near airport and food. Nice pizza place and a smallish free pool in the shade. Internet isn't working and can't ask assistance from anyone. positive- place is 5 minutes from the airport. good place with good service and nice location . Easily to be found . Upon checkin, the lady at the front desk took a photo copy of my passport, then was going to leave it on top of the tall counter so anyone who walked by would have access to it. When I got into the room... gross!!! The bathroom was disgusting and I was afraid to sleep on the dirty sheets. But I had gotten there late and was leaving early, sooo... Do yourself a favor and Don't stay here. Good location. 5 min from the airport. Room was not ready for a guest. Not clean. Bathroom dirty. Do not stay here. Please dont stay here. Me and my gf stayed here on night because it is near the airport. When we arrived we didn't receive the room we booked. So they brought us to an other room. That room was so dirty. The towels were used and the bedsheets not changed. Anyway we were very tired so we layed in bed. Seconds later we got bitten from HUNDREDS BEDBUGS. We told the reception to give us an other room but they didn't. Also we asked for our money back but they didn't want to. After changing the bedsheets we saw that the whole mattress was full of blood from previous guests. We ended up not sleeping at all and went straight to the airport. Do yourself a favor and don't stay here. I booked my room months in advance and before doing so I called SDR for advise. As we are arriving Cebu at around 6.25am on Nov 23 I was advised to book Nov 22 and my check out time will be before 12pm. Upon arrival, I got scolded by the lady staff as my booking was the previous day. I have shown her the remarks/notes on my booking and explained that I called for advise before booking. I was told that there were guests who wanted to get the room but she wasn't able to give as she was waiting for me to arrive. Once we got into the room, I used the bathroom and found a used bar soap with hair. Looks like they don't really change it per booking. The shower is spoiled - there's just a little amount of water that comes out from it. The towels smells funky so we didn't use it. We suspect that they don't change the amenities and sheets so we just left our bags in the room and don't dare to even sit on the bed. We will never book this place again. The reception was dusty and old. The room was clean. It just had creepy feeling. The building was old. Room is big and relatively clean however the cr needs updating And cleaning. No toiletries given since accdg to the staff they run out of supplies. Quite expensive for the price. Can probably get a nicer and cozier room for the same price. Cannot recommend anybody to stay there. Rooms are smelly and dirty, pool area is terrible. Reception gives you different information. Bathroom is tiny and mountings are dirty and old. Shower head blocked and water pressure almost non existing. Think twice before you book! Old building, creepy, and smelly. Only stay here if you are very tight on budget. We stayed just one night. We had booked a studio room which wasn't available when we arrived . We got one room which seems to be the same room which we booked . It was a big room with a kitchen and 2 bathrooms which wasn't really clean. We had also one cockroach next to the bed . Also we could use the pool . The small one which was in the shadow is for free and the big one with sun the whole day you've to pay 200 peso each . Next by are some restaurants on the corner . The habe one Korean restaurant. The food was awesome .